Gavin and Catriona nibbled the shortbread and then bundled in their winter coats, scarves, gloves, hats and boots. They went out into the snow. “It's hard to walk in all this snow,” Catriona said. Catriona glared at her brother. “Oh yes we can. We can ran as fast anytime we want. I don't want to because I just don't.” She kept walking, ignoring Gavin. “What's that noise?” Gavin stopped to listen. The went down to the stream. “Look! The ice is melting and water's running under it. Mama was right. Spring is almost here,” Gavin said. Catriona stared at the stream. She watched the water bubbling up through the ice and saw that in some spots it was clear and thing. “Spring is coming.” She smiled and clapped her hands. “Look at the pine trees. Some of the snow has fallen from the ends of the limbs. We can see green now instead of just snow.” Gavin pointed across the stream. “You're right, Gavin. I see green pine needles. I'm so happy. Winter's nearly gone,” Catriona said. Just then a red bird landed on a branch of one of the dead trees. It chirped and sang Gavin and Catriona a song. “There you go, Catriona. Now you can get rid of your winter blues. Spring is almost here.” Gavin hugged his sister. Every day after that Catriona and Gavin went for a walk. 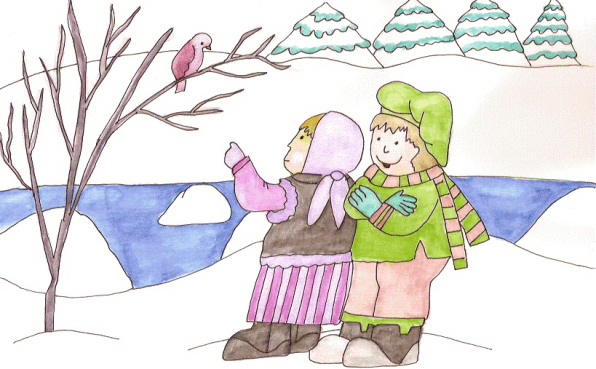 Each day the snow melted a little more until finally one day there was nothing but green grass and chirping birds.